In conjunction with FNTSY Sports Network, the FSLR Ultimate Sleepers bracket is back for another year, and the march has begun to crown a champion - the king of value for 2015 draft season. FNTSY's Pat Mayo and FSLR's Jon Collins discuss each of the first round match ups and pick which 2015 sleepers they think should advance. Check the bracket page for rules, all the match ups and, most importantly, info on the authors who have contributed to this project. As a reader, your job is simple: Vote for the author you think made the most compelling case, and/or for the sleeper you think provides the best draft day value at the end of the piece. Voting closes Friday at Midnight Eastern. 2015 Injuries: NFL Injury Report | First Round: Safe/Bust | RB or WR? | GRONK | Strategy | Dez or DT? | CJA or Beast Mode? If you missed my original spiel on Travaris Cadet, how dare ye. That's fine though, I’ll summarize in the easiest to understand way possible - CLASSIC MOVIE TITLE FORM!!!!! Travaris Cadet or: How Shane Vereen’s departure has vacated an established role in the Patriots' offense that will generate low-end RB2 numbers in PPR formats. The past two seasons Vereen averaged over six targets a game. The “pass-catching back” role has been a fixture in Bill Belichick’s offense since the days of Kevin Faulk. He only has to fend off Brandon Bolden and James White for the gig. Shouldn't be difficult. With his acumen in the return game, Cadet should continue the trend of New England squeezing extra positional value out of its players. Plus, he’s far more suited for the role than Danny Amendola, and just ask Darren Sproles owners, those return points are a nice bonus every few weeks. Cadet be taken in the last round or bought for $1 in an auction. Brag to league mates he’s the best a man Cadet. While it clearly appears like that last one is the clincher, there is an overarching strategy element in drafting Cadet too. With the elevated bust rate of high-end RBs, I prefer targeting safer WRs at the top of drafts; grabbing a pair of tier two/three/four RBs along the way and peppering the position in the later rounds. Cadet should be one of those RBs. Also, since I don’t think anyone else is doing it, I’m going to use the rest of my space to defame my opponent's selection, Marvin Jones. Let me ask you this: What do you want from a sleeper? Actually, I’ll take this one: A sleeper is either A) A talented player, who’s yet to be given a proper opportunity and could crack into the upper echelon of the position with the right break or B) A capable, consistent every week starter. Players like Duke Johnson and Buck Allen fall into category (A); Cadet is a (B) and Marvin Jones is a (C) - some loser you don't want. Jones is coming off both ankle and foot injuries, which are the most reoccurring, and thus problematic for any football player, and returns from a year’s absence to a completely different offense. Hue Jackson has embraced a run-heavy philosophy with Jeremy Hill and Gio Bernard, and the return of Tyler Eifert combined with that pesky Mohamed Sanu still lurking about will restrict Jones’ target ceiling; there simply won’t be enough opportunity for Jones to have a viable fantasy impact unless something tragic happens to A.J. Green, and even then, there’s no guarantee a gimpy Jones becomes Andy Dalton’s primary aerial weapon. Some will point to Jones’ 10 TDs in 2013, but, remember, four of those scores came in one game, and the Bengals other offensive weapons, Green excluded, were not as engrained in the offense as they are now. Essentially, Jones is nothing more than a WR2 on his own team, in a run-dominated offense, who’s never seen double-digit targets in a game, and has to get incredibly lucky (again) with TDs just to be a fringe fantasy WR3. Ya, he’s great though, thanks. 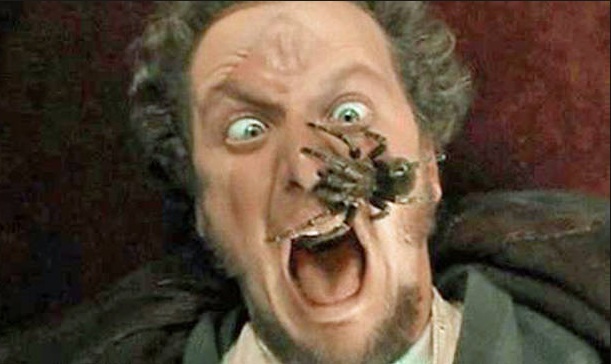 I'd rather have MARV from the Sticky Bandits. Come on people, give your head a shake and do the right thing. #VoteCadet. Two years ago, Bradford was on pace for a Top 8 QB finish with a poor Rams OL and Jared Cook as the team's leading receiver. Jared… stinkin… Cook. Since the "Eagles QB" part might be a bit confusing, in simple terms, Mark Sanchez and Nick Foles combined to outscore Tony Romo last year. Comparison of offenses: Eagles ran 1,127 plays and Rams just 957. Yards 396.8/314.7. Points 474/324. Oh, and as for my competition here… Look, I'm the biggest Bridgewater supporter you'll find. I threw fits over people not ranking him as the top QB in last year's class and think he has QB1 potential. However, I think he settles in as a mid-teen QB given the offense. Who's offense is it? Adrian Peterson's! Bridgewater doesn't need to pass for 4,000 yards or 30 touchdowns. Mike Wallace and Charles Johnson are nice, but Jordan Matthews and Nelson Algohor have much more upside, and then you have the Zach Ertz > Kyle Rudolph part. Plus, you can get Bradford two rounds cheaper (in the 12th)! Back to the numbers, Sanchez and Foles threw for 4,581 yards and 27 TDs. You don't think Bradford can do that and more. I'll say it again TOP.FIVE.FANTASY.QB.POTENTIAL! Let's get it out of the way… Bradford has to stay healthy. We all know that. But just imagine if he does! Under Chip Kelly, the "Eagles quarterback" (that's anyone who has started for the Eagles… because there have been plenty already) is a Top 10 Fantasy QB. Two years ago, Bradford was on pace for a Top 8 QB finish, 3,856 yards and 32 touchdowns. You don't think Bradford can easily hit that mark, and then some, in Philly? Bradford is a very smart passer who can keep this Eagles offense cruising along at its breakneck pace. He also has better weapons than he ever had while in St. Louis. The Eagles ran 170 more plays than the Rams did last year (1,127 to 957) and averaged a whopping 82.1 yards per game more (396.8 to 314.7). Oh, and they only scored 150 more points or 9.4 points per game too (474 to 324)! You want to tell me there isn't huge potential here? When it comes to Fantasy Football, what position scores the most? Quarterback. And what position often returns the biggest value when drafting sleepers late? Yep, quarterback. With this high-octane offense, a terrific collection of offensive talent (and offensive line) and a healthy 16-game season, Bradford has the potential to reach the Top 5 for Fantasy quarterbacks… yes, Top FIVE.